Events are an excellent way to attract new prospects, deepen relationships with existing customers, and educate industry and the general public about trends in IT. But an event needn’t be a CES-scale trade show. Smaller organizations can build events around more economical formats, from webinars to open houses. 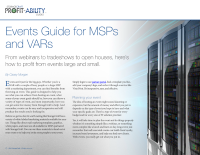 Read Events Guide for MSPs and VARs for practical advice on choosing, planning, promoting and executing your event. Let StorageCraft senior content management specialist Casey Morgan help you determine your target audience—and how best to reach it.